Looking down at Barnett Road from the bike bridge on the Bear Creek Greenway trail. Riding my bike along the Bear Creek Greenway, I’m wondering once again why Jackson County has managed to complete such a magnificent transportation and recreation asset while we in the mid-valley are still floundering around with similar ideas. Steady, long-term support by government and private interests is one factor. It is said that the Jackson County Court got the idea for a bike trail along Bear Creek rolling in 1899, when the commissioners passed a $1.25 tax on all bicycles in the county and the tax was paid on about 400. What happened to that $500 in tax revenue is lost in the mists of history. 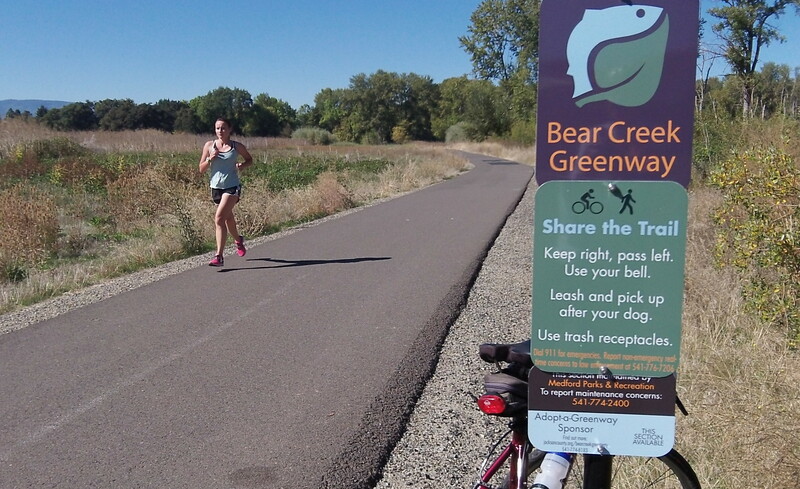 But the idea of a trail along the stream from Ashland to Central Point via Talent, Phoenix and Medford was revived in the 1960s, and Rep. Al Densmore from Medford got the legislature to authorize the Bear Creek Greenway in 1973. The idea was modeled on the Willamette River Greenway program passed in 1967, but in Southern Oregon the concept was actually carried out. 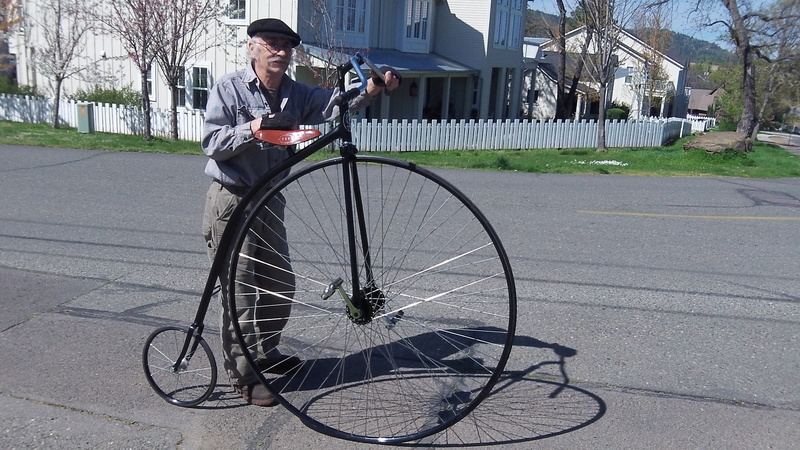 Jacksonville resident Jason Hord says he has ridden the Greenway on his ordinary, the style of bike popular when the trail was first envisioned in 1899. Since then government and private interests have cooperated on the project, acquiring land in the early stages and building the trail, parks and related facilities since. A few years ago, $190,000 was needed as the local share to obtain a $1.7 million grant of federal transportation enhancement funds. Cities and the county contributed, and so did several foundations as well as bicycle shops and clubs. Now the last 1.4-mile segment in the 20-mile trail is either done or close to being done. Geography and common sense helped. The cities along this route are close together. Bear Creek provided a convenient corridor, and nobody treated the creek as some sacred object near which no man-made structures are allowed. Yes, the creek is being restored and protected to the point where salmon can be seen. But parks and a bike route are not considered an intrusion. The trail does not follow only undeveloped ground. It also runs right through the Medford metro area, partly under the I-5 viaduct, and it skirts several freeway interchanges, including the one at Phoenix now being rebuilt. 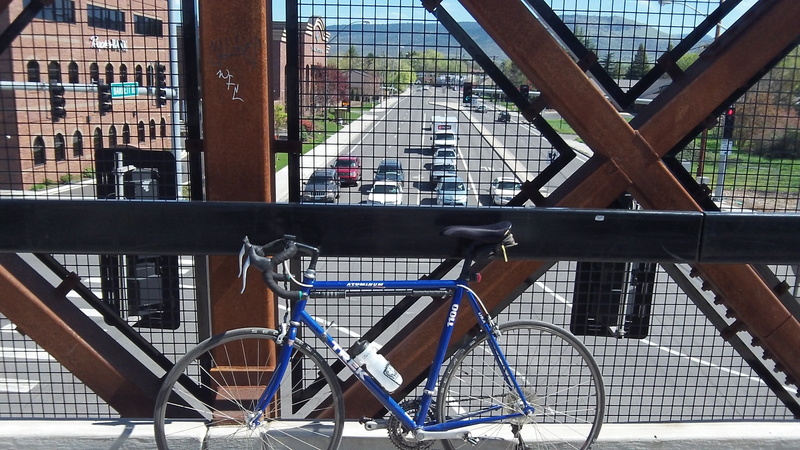 A massive bike bridge across Medford’s busy Barnett Road was completed in 2010. This trail has many recreational uses but also serves an important function in safe, healthy and nonpolluting transportation. If we in the mid-valley had thought of it more than a century ago, or at least in the 1970s and followed through, we might be farther ahead than we are. The trail is popular with joggers, too.